Be a star on the field in no time! 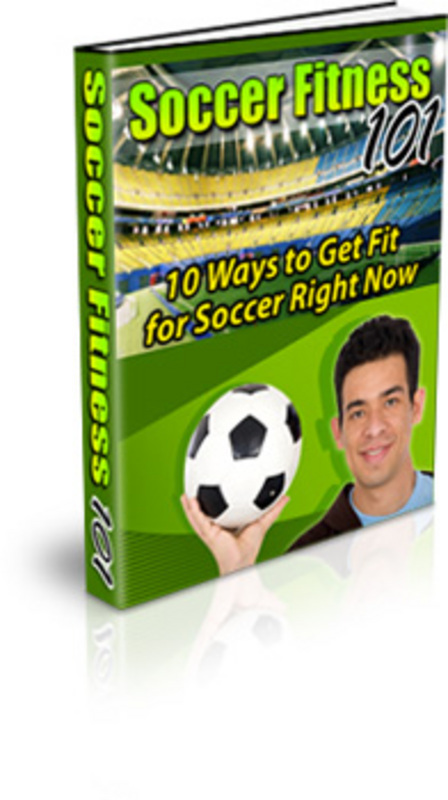 Get Fit For The Soccer Field In 10 Easy Steps! Discover the fitness secrets of the pros! With soccer season looming just around the corner its never too early to start getting ready. Soccer is an intense game, and its going to take a lot of work on your part to make sure that youre ready to stay ahead of your competition out on that field. The question is, do you know what it is you have to do to get yourself in fit, fighting form before soccer season starts? Or are you just aimlessly jogging around your block a couple of times a day hoping that it will provide your muscles with the conditioning they need to keep up with ninety minutes of fast paced, non-stop action once you hit that turf? If you are among the latter group there are two things you should know. One, that isnt going to get you anywhere, and two, youre in good company. Many people do not realize that training for a competitive sport such as soccer which requires you to have high levels of endurance and cardiovascular fitness. Plus the work rate required is much higher than the half hearted effort they make to get in shape every New Year, before eventually deciding to throw in the towel. If you are going to get serious about soccer, you need to get serious about your fitness. We Can Help Put you On The Right Path! Fortunately for you, the process of getting in shape top play soccer is not a well guarded secret. You simply have to know the guidelines that the professionals use to get and keep their bodies fit so that they are ready for anything every time they step off of the sidelines. There are no magic powders and potions, no special tricks or gimmicks. Anyone can do it, if they are willing to put in a little time and effort. Thats right. There are ten basic pieces of knowledge that you need to be both comfortable and familiar with, and once you have accomplished that and put them into play you will have everything you need to be sure that you are ready the first time you step onto that field and set you up to enjoy a great season. Well teach you the guidelines that the professionals pay personal trainers thousands of dollars a year to hear! Youll have access to the basic fitness techniques used by competitive players around the globe, and youll learn the truth about all of the propaganda that the media has been selling you, and why its never going to work. 1) Discover the lifestyle changes that will make a world of difference in your playing career. Although you are probably looking forward to your pre-season conditioning regime with approximately the same amount of enthusiasm as you would a root canal (although with slightly more determination to see it through, no matter what the cost) we can show how to make training as simple as possible by tweaking your current habits rather than completely overriding your entire lifestyle. No fad diets. No obscene protein drinks. Just ordinary activities that the professionals do every day of their lives, available to you for a fraction of the cost. 2) Youll learn how to do it while having fun! Yes, granted, there are millions of fitness programs around the world that claim theyll be able to help you to get fit and lose weight while enjoying yourself at the same time. Most of them lie. Honestly! Many of them appear to have no idea that most peoples idea of a good time does not involve inflicting severe pain on themselves while twisting their body into positions it was never meant to go in. Well teach you how to take something you already love (soccer) and get yourself fit while having a great time. What would you do to be able to meet all of your fitness goals in 10 easy steps? As we told you before, the professionals pay personal trainers thousands of dollars to get them into shape for the season. We can offer you access to some of their best advice for a fraction of the price! You probably dont want to have to spend thousands of dollars to get yourself into shape for the season; there are so many better things you could be doing with your money. Come let us send you on the road to soccer fitness!